Almost three years ago, I reported here about the strange and wonderful arrival of the Art Gallery of NSW's iconic Pukumani Poles in its so-called Colonial Courts – perfectly placed in chronological terms, but utterly challenging beside the best efforts of John Glover to recall a halcyon time in Tasmania before the Black War drove Aborigines out on to Bass Strait islands. Even more so beside a colonial portrait that emphasised the sitter's class through the book she prominently held tight to. This was announced by the excellent Barry Pearce as but the first stage of a rehang that would acknowledge Aboriginal art as fully 'Australian' – hanging it beside the Nolans and von Guerards and Tillers with proper equality. Now we have the rehang – but Pearce has gone, replaced in the process by Wayne Tunnicliffe – a man who's clearly much less comfortable with the notion of Indigenous and non-Indigenous art equality. Mind you, it didn't help him that the process of melding black and white that has reportedly happened with ease at State Galleries in Perth and Adelaide was muddied in Sydney by the sudden removal of Aboriginal art from within the Australian art department by its then Chief Curator, Hetti Perkins – who then resigned in a huff! Director Edmund Capon had also resigned – so there was no hope of replacing Perkins before Dr Michael Brand arrived (which he's now done) as Director, leaving the Indigenous ship rudderless. 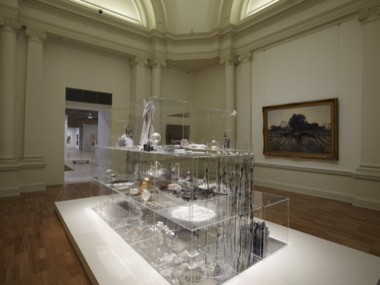 Indeed, one might add that the AGNSW Grand Reopening was casually scheduled against the National Gallery's significant Indigenous Triennial debut, and contained not a single event (of the 50 on offer) scheduled to celebrate the Indigenous portion of Australian art. And the hang itself offers some really mixed messages mixed messages on the walls. Oh that Tunnicliffe had taken note of the significant message offered by John Olsen as long ago as 1956 when he noted of his work 'Dry Salvages', “My painting takes on its particular abstract quality because only in this way can I express my search for direct mystical experience...of an animistic quality throbbing throughout nature”. How often have you stood in front of Aboriginal 'Abstraction' and sensed both the throb and the numinous as your eyes lead your mind beneath the dots or the rarrking? So – how much of that connection can be found as you progress through the dozen or so galleries now devoted to taking you from the mid-19th Century to today? Absolutely nothing! There is a brave statement: “For the first time in the modern Australian galleries, Aboriginal and Torres Strait Islander art has a significant presence. 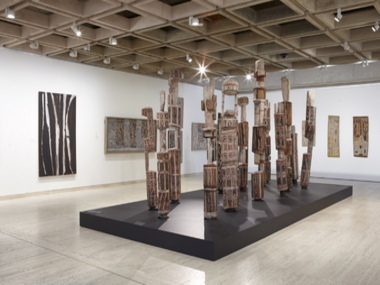 The magnificent Pukumani graveposts, acquired in 1959 from the Tiwi artists of Melville Island, are exhibited alongside seminal bark paintings by Mithinari Gurruwiwi, Wandjuk Marika and Munggurrawuy Yunupingu, and the work of artists influenced by Indigenous traditions, such as Tony Tuckson”. Don't know where the Torres Strait comes in – but it is true that this one room works excitingly to link Tuckson, the AGNSW curator who first treated Indigenous art as art (rather than ethnography) with the Tutini that he commissioned and the barks he bought. And I'd give my eye teeth for his bold 'Five White Lines on a Black Background' painting. Fairweather is also there – though it's never been proven to my satisfaction that he inhabited Aboriginal art in his aesthetic. Fred Williams, on the other hand might just have felt something – so it's good to have that idea offered for consideration. But that “significant presence” is a cruel furphy. For the only other appearance of the art movement that has for many become the Australian artform of the past 30 or so years is some early Papunya work that retains much of its ethnographic power and seemed to me to say nothing whatsoever – as perhaps Emily Kngwarreye or Tommy Watson might have done – to the cold mix of abstract offerings from Janet Dawson, Howard Taylor and Ian Burn, leading on to the physical works of Ken Unsworth and Mike Parr. Knowing that Michael Brand made the effort to cross North America to attend the opening of the great Kaplan/Levi exhibition of Aboriginal art in Seattle recently, I can only hope for an early reconsideration of this hang. Perhaps his first task is to find a strong Indigenous curator. And in doing so he might like to quietly observe that the high proportion of Asian faces in his galleries all seemed to want to photograph the limited offering of Indigenous art. But mysterious signs banned the practice. Why can you photograph Nolan and not Munggurrawuy or Big Jack Yarunga?